David was born on the 18 May 1936 in Darlington, the elder of two sons. His father was a tool maker, and his mother a commercial artist, decorating ceramics. His younger brother John, emigrated to Australia in the early 90s. David’s father was a Londoner, and during the war they lived in London. During the blitz David and brother John, were taken by their mother to Lincolnshire. However they didn’t like it, and soon returned to London. The family lived in Harrow, and David remembered seeing the docks in London ablaze. He also remembered the buzz bombs being dropped on London, and during his spare time collected pieces of shrapnel. After the war the family returned to Darlington, and then moved to Newton Aycliffe. After leaving school David went to college in Darlington. He had a keen enquiring scientific mind, and as a child constructed his own radio set, so it is probably not surprising that he began work in the design office at Ferguson’s radio manufacturers in Spennymoor. It was here that he met Marian, who worked in the factory as a radio calibrator. David did National Service with the RAF in Lincolnshire, where he was responsible for looking after the RAF radio transmitters. Everything in the station had to be kept spotless, so they came up with the idea of tying towels around their feet so whenever they went anywhere in the building, the floor would be polished to a high sheen. Marian and David were married in 1958 in Kirk Merrington, and in 1963 David got his electronics certificate. It was in the early 60s that David and Marian moved to Cumbria, initially to Whitehaven, so David could work as an instrument technician in Sellafield. It was a work colleague that suggested David apply for a job with the new ITV station that was starting in Carlisle, Border TV. So in 1963 the family relocated to Carlisle. David's first job with Border TV was as a camera man. He then moved into video control ultimately becoming an outside broadcast supervisor until he retired in 1995. As well as working for Border TV, David created his own pirate TV station. He built a spot scanner out of bits and pieces and would broadcast simple images to a friend living in Newcastle. This pioneering endeavour was brought to an end when a neighbour, who worked for Customs & Excise knocked on his door, and said "I know what you're doing, you'd better take it down." For the past 59 years, David has been very happily married to Marian. Their son Michael was born in 1960, and their daughter Claire in 1965. David instilled in Michael a great love of the mountains. There were three keys to David’s life, family, fell walking & astronomy. Fell walking & astronomy for David weren’t hobbies, but ways of life. David was a keen fell walker, and was a National Park Warden for 37 years. Because of his mountaineering expertise, David was called upon to assist with the search for wreckage and personal belonging following the downing of Pan Am 103 over Lockerbie. David was assigned to Strathclyde Police as a mountain guide supervisor, to assist them as they swept the mountainside for evidence. His other great passion was astronomy. He was a very serious amateur astronomer, constructing his own telescope & observatory in his back garden. In 1968 he was elected into the British Astronomical Association. But probably the greatest honour, was being made a Fellow of the Royal Astronomical Society. He was invited to join this august organization because of the significant contribution he made, particularly in the study of the Aurora Borealis, or Northern Lights. David received worldwide acknowledge for the work he did. He got his first magnometer, which detects changes in the earth’s magnetic field, from Sweden, but felt he could do a far better job, and made his own. His design was even used by NASA for a while. In Carlisle David was the founder member of the Border Astronomical Society. He used the local media to ask if anyone was interested in forming an astronomical society for the city and got a good response. They originally met at Morton Community Centre. About 1979 David was offered a 16” telescope mirror from a member of the Scottish Astronomical group, Harry Clough. This led to the building of Trinity School Observatory as a member who taught physics there and ran an astronomy club persuaded the Education dept. to purchase the mirror. The school paid for the building and the work was done by Technical College students over a ten year period. Border Astronomical Society (which is open to all) moved there in 1986 and is still thriving 46 years after its founding. The city would not have a public observatory if David had not founded Border Astronomical Society. Although retired, David wasn’t one for sitting around watching TV, he always had to be doing something, and keeping himself active, both mentally and physically. David is also grandfather to Harriet, Alexander, Talia & Gabriel. They remember how he would share his love of astronomy with them, showing them the observatory he built in his back garden, and looking at the stars together. 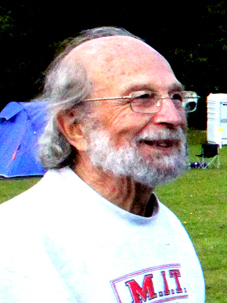 David passed away on the 14 January, aged 80.